The metal-oxide-semiconductor field effect transistor (MOSFET) is the important semiconductor device for digital and analog circuit designs. Its major asset from digital perspective is that it performs very well as a switch and it introduces very few parasitic effects. For digital circuit design the transistor is thought as a switch. When the voltage is applied to the gate which is larger than the threshold voltage (VT) a conducting channel is formed between drain and source. In the presence of voltage difference between source and drain electrical current flows from drain to source. The conductivity of the channel is modulated by the gate voltage. If the voltage difference between gate and source is large then the resistance of the conducting channel is small and larger current flows through the channel. When the gate voltage is lower than the threshold no such channel exists and the switch is considered as open. 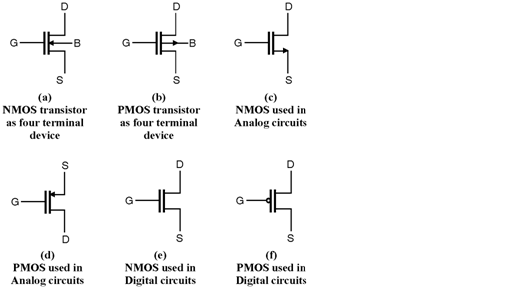 Two types of MOSFET devices can be identified. The n-channel MOSFET shortly NMOS and p-channel MOSFET shortly PMOS. 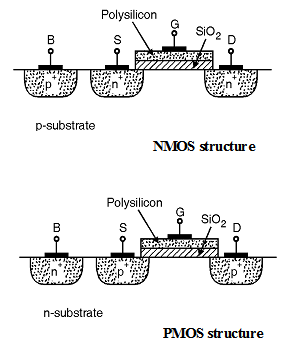 The NMOS transistor contains n+ drain and source regions which are placed on p-type substrate as shown in Figure. In this device the current flow is due to electrons which moves through the channel between source and drain. In PMOS devices an p+ drain and source regions are embedded in a n-type substrate as shown in Figure. In such a transistor current is carried by holes moving through a p type channel formed below the SiO2 layer. In a complementary MOS (CMOS) technology both devices are present. The cross section of n-well CMOS process is shown in Figure below. Since the body is generally connected to a DC supply i.e. Ground for NMOS and VDD for PMOS. Most of the time body is not shown on the schematics. If fourth terminal is not shown in the schematic then it is assumed that the body terminal is connected to the supply voltage.